1. Preheat the oven to 200ºC, gas mark 6. Cook the potatoes in boiling water for 15 minutes or until just tender, then drain. 2. Meanwhile, cut the pork in 4, place between clingfilm and flatten with a rolling pin. 3. Place the courgette and carrot in a large bowl, cover with clingfilm and microwave on high for 2 minutes. Drain and stir in the pine nuts, then season. Spread over the pork, roll up the meat, and brush with a little oil. 4. Heat the oil and saffron in the pan used to cook the potatoes, then return the potatoes to the pan with the mustard. Roughly crush and season well. Spread out on a large baking tray and top with the pork. Roast for 25 minutes or until the pork is cooked throughout with no pink meat. 5. 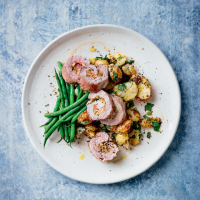 Stir the mint into the potatoes and serve topped with the pork sliced, with green beans and seasoned with black pepper. This recipe was first published in Tue Apr 05 10:02:00 BST 2016.